सीता नवमी | वट सावित्री व्रत | आज का भजन! | भक्ति भारत को फेसबुक पर फॉलो करें! Beautiful view of Shri Navgrah dham with natural light magnifying effect through ventilation at top of the dham. Silver cotted Shivling with Gan in the middle of the temple with Nageshwar Mahadev vigrah. Maa Ganga putra baba Bheeshma on bed made through arrows, this frame also includes Shri Krishna and Gandiv dhari great warrior Arjun. Shri Shiv Mandir is situated on the opposite side of Shri Bhairav Mandir in Nehru Place. 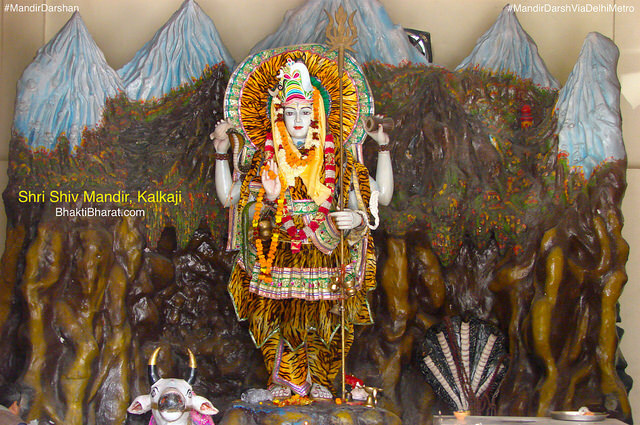 Maha Shivaratri is the most prominent festival of Shiv Mandir. दिल्ली NCR मे माता के प्रसिद्ध मंदिर! दिल्ली के प्रसिद्ध हनुमान बालाजी मंदिर! दिल्ली और आस-पास के प्रसिद्ध मंदिर!